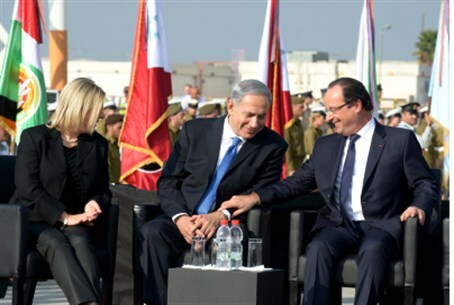 Prime Minister Binyamin Netanyahu gave a warm welcome to French President Francois Hollande at Ben Gurion Airport Sunday. “France, like Israel, aspires to a stable, moderate Middle East in which the peoples live in peace with each other, in security and mutual respect. "Today we will welcome French President Francois Hollande and ministers of his government, including Foreign Minister Laurent Fabius,” Netanyahu told the Cabinet at its weekly meeting. “They come as friends and will be welcomed as friends. This visit would be important at any time both for bilateral relations but also, of course, in light of the talks being held in Geneva on the Iranian nuclear issue. “We will discuss this issue, which tops the agenda, as I will with Russian President Vladimir Putin when I visit Moscow on Wednesday, and as I will with US Secretary of State John Kerry, who is arriving here on Friday. John Kerry is an old friend and he is also a friend of Israel. He is making an effort to advance the issue of peace between us and the Palestinians, and of course we will discuss this too, but we will also discuss the issue of Iran. “I would like to make it clear that there can be disagreements even among the best of friends, certainly on issues related to our future and our fate. It is the obligation of the Prime Minister of Israel and the Government of Israel to uphold our vital interests and thus we are doing vis-à-vis an agreement which is a bad agreement. “I hope that we will succeed in convincing our friends this week and in the days afterwards to achieve a much better agreement, and it will be possible to do so. Iran is under economic pressure and continuing – and even increasing – this pressure will be able to achieve the much better result of a peaceful, diplomatic solution. I believe that many in the region and beyond it share this view."